Dogs are wonderful pets: loyal, friendly, comforting. However, part of their disposition is going to rely on you! Dogs need training in order to understand what behaviors are acceptable and which ones are not. One negative behavior most dogs struggle with is barking. While barking occasionally or in certain situations is definitely appropriate for these animals, some dogs take it to an excess. They might drive you crazy barking at every little thing! This can not only cause you irritation, but if you live in an apartment or condo, it can also cause issues with your neighbors. Training can help your dog learn when barking is appropriate, and tools can help you ensure they learn quickly and effectively. A good tool for some dogs is a bark collar. The K9konnection Anti Bark Dog Collar is an excellent, affordable option that will help you teach your dog when it's ok to bark. What is K9konnection's Anti-Bark Collar? The K9konnection Anti-Bark Dog Collar is an anti-bark collar that uses multiple levels of both sound and shock to train a dog to avoid barking at inappropriate times. The dog collar comes in a variety of sizes for large, medium, and small dogs, and it also has adjustable sensitivity levels for your pup. Purchasing this collar will get you one anti-bark receiver, one adjustable dog collar made of nylon, one testing unit, two long metal shock electrodes, two short metal shock electrodes, a 6-volt battery, and an instruction manual detailing the product and how to use it. This unique dog collar uses both sound and shock to train your dog to stop barking inappropriately. As your dog continues to bark, the sound and shock will become higher in intensity, signaling your pet to stop the negative behavior. As dogs find the sound and sensation of the shock unpleasant, they'll quickly learn that barking is a negative action, and they will start doing it less. There is little additional training required from the owner when using a collar. When your dog first begins to bark, they will only be corrected with a warning sound. This sound will let your dog know that they are doing something wrong, and it gives them a chance to stop the negative behavior before the collar shocks them. However, if they ignore both sound-based warnings and bark again within 30 seconds of the previous yap, they'll receive their first shock – a level 1 shock, which is very low. If the dog stops barking now, for at least 30 seconds, they won't receive any more corrections. If your pet continues barking within the 30 second time frame, they'll receive up to four more shocks, each one a bit more powerful. 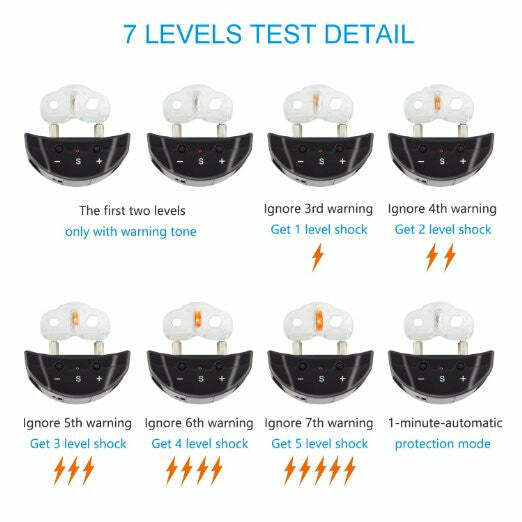 This means the total cycle has 7 levels of correct, beginning with the first warning tone and ending with the last level 5 shock. If the barking continues after this cycle, the collar turns off for one minute to protect your dog. If your dog is still barking after this minute, the collar goes through the cycle again, using sounds and shocks to correct their behavior. If at any time your dog stops barking for 30 seconds during the cycle, the cycle will restart from the warning sounds again. Is The K9Connection Anti-Bark Collar Safe? In general, shock collars are a safe option for training stubborn dogs who like to bark as long as the correction is gentle. The K9Connection collar goes beyond the usual precautions to ensure your dog is physically safe and doesn't get too uncomfortable or stressed out while being trained. The combination of sound and shock is especially important, as it gives your pet an opportunity to stop the negative behavior before they even feel the physical effects of the collar. Another safety feature is the ability to adjust the collar's sensitivity. You can turn it up or down depending on how sensitive the device is to your pet's bark. Being able to adjust this setting means it's very unlikely something other then your dog barking will trigger the sound and shock feature. This ensures your pet is only corrected for their inappropriate barking, leading to quicker training and less confusion for your pet, who just wants to learn and make you proud! See more about how the collar works safely on your pet in the video below. 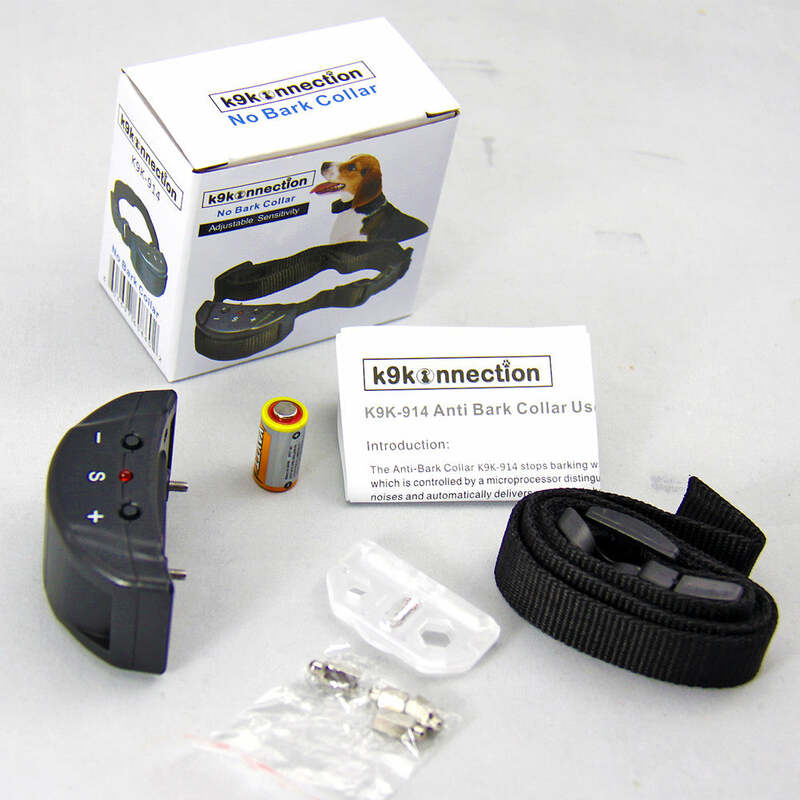 The K9connection Anti-Bark Collar requires a bit of set-up before it's ready for use. Once you open the box, you'll see the different parts of the collar. You'll need to first do some adjustments to ensure the collar is right for your dog. First, you need to put the metal prongs into the collar. Choose which ones to use based on your dog's size and breed. The larger ones should be used for bigger dogs with thick coats, while the small ones are better for small breeds and dogs with thin fur. 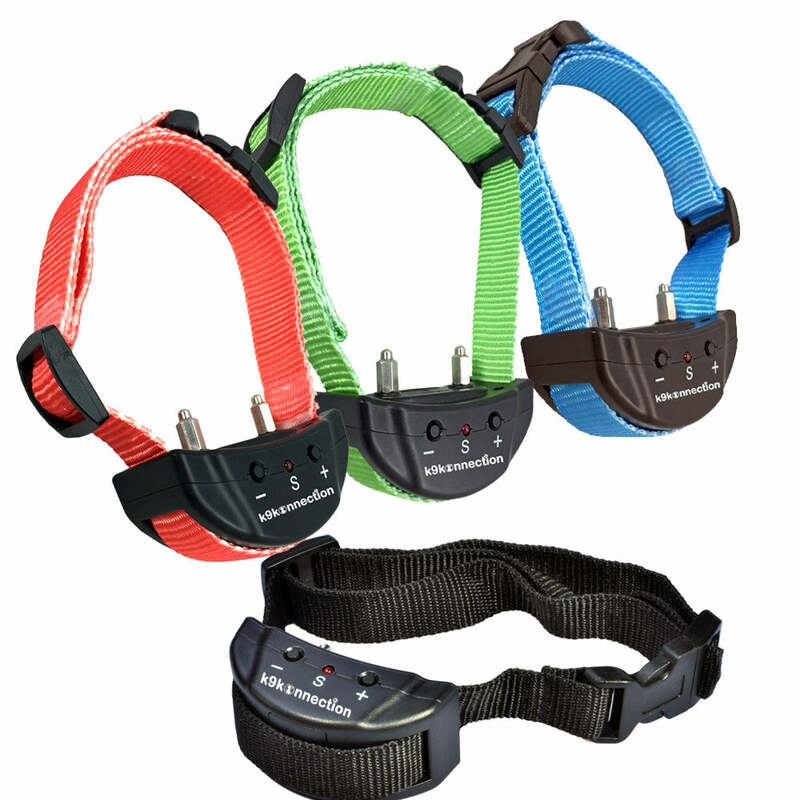 Attach the unit to the included nylon collar and adjust the fit so it is snug enough around your dog's neck. Now that you have adjusted the collar, insert the batteries. Make sure to take the insulating paper out of the battery compartment. Once the unit has power, you can test to ensure it's working properly. 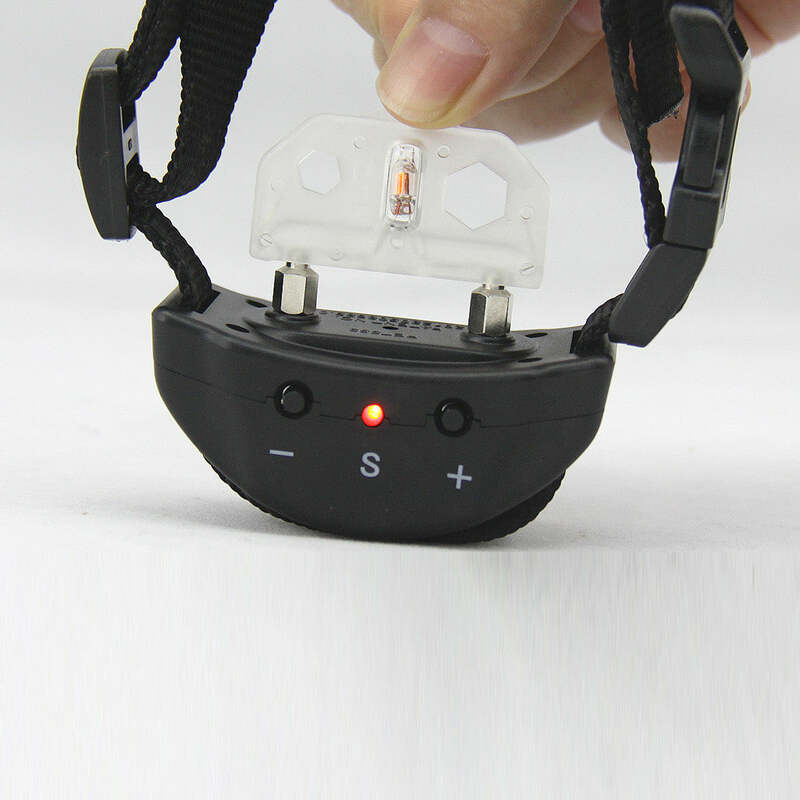 Use the test light included with the collar. Attach it to the electrodes using the wires on the tester. Blow into the hole on the collar, between the two electrodes. The collar should light up the third time you blow, signifying the warning shock. The light should get brighter each time you blow, showing you a higher level of shock sensation.